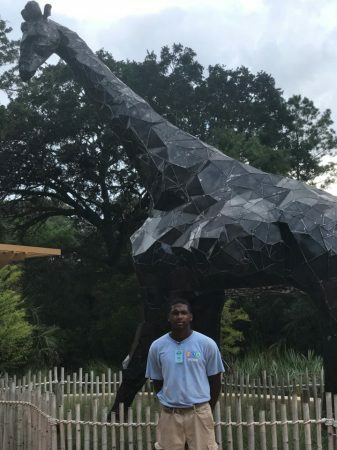 This summer, Brian Smith ’20 is interning as a mammal keeper at the Jacksonville Zoo & Gardens in Jacksonville, Florida. As part of the 12-week program, he has learned how to care for all kinds of WildCats, including lions, tigers, cheetahs, and Florida panthers. He also completed a tiger identification project to help zoo visitors differentiate between the seven Sumatran and Malayan Tigers. Some of his other day-to-day tasks include feeding the animals, providing enrichment, cleaning exhibits and night houses, recording daily observations, and interacting with the visitors through Keeper Talks.